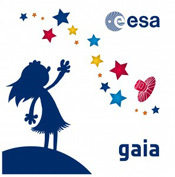 The second Gaia data release, Gaia Data Release 2, was published on 25 April 2018. Image credits: ESA/Gaia/DPAC, A. Moitinho / A. F. Silva / M. Barros / C. Barata, University of Lisbon, Portugal; H. Savietto, Fork Research, Portugal. The UK Gaia Science Team and the Airbus Defence and Space Gaia Team won two Centenary Sir Arthur Clarke awards. Watch one of our cartoons explaining Gaia and its science. Choose a cartoon. Combined Hertzprung-Russell diagrams of star clusters. Hertzprung-Russell diagram displays the physical properties of stars, and their dependence on the star's mass, age and chemical composition. The intrinsic brightness is plotted vertically, brightest at the top, derived from Gaia's distance and brightness measures. Gaia's colour is plotted horizontally, bluest at the left. Star clusters are dynamically bound groups of hundreds to many thousands of stars sharing the same formation history, and thereby being of the same age and chemical composition. Covering stars with a wide range of masses, they provide invaluable information on stellar evolution through their Hertzsprung-Russell diagram. But for that to be extracted, distances need to be accurately known, and high-accuracy photometric data is needed. 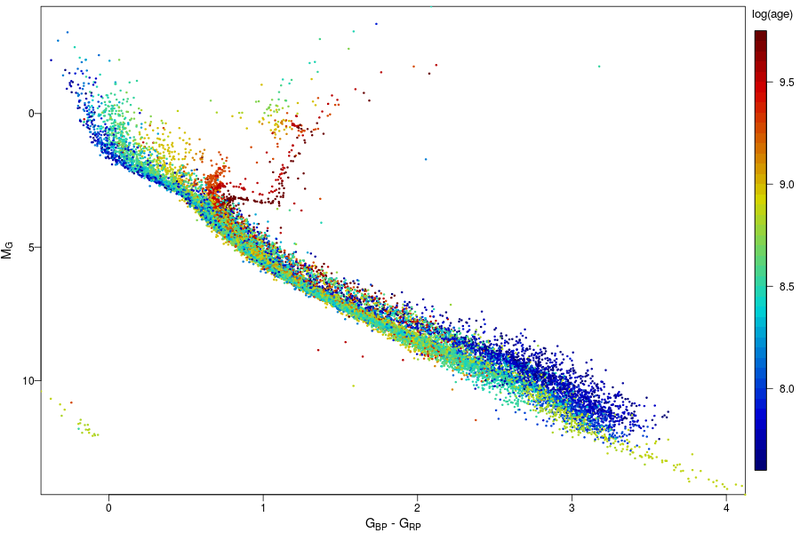 Gaia has provided both for a sample of 46 young galactic (or open) clusters, and 75 old globular clusters. The first image (left) shows the combined HRD for 32 open clusters, where the effects of cluster age can clearly be distinguished. Blue is younger, red is older. 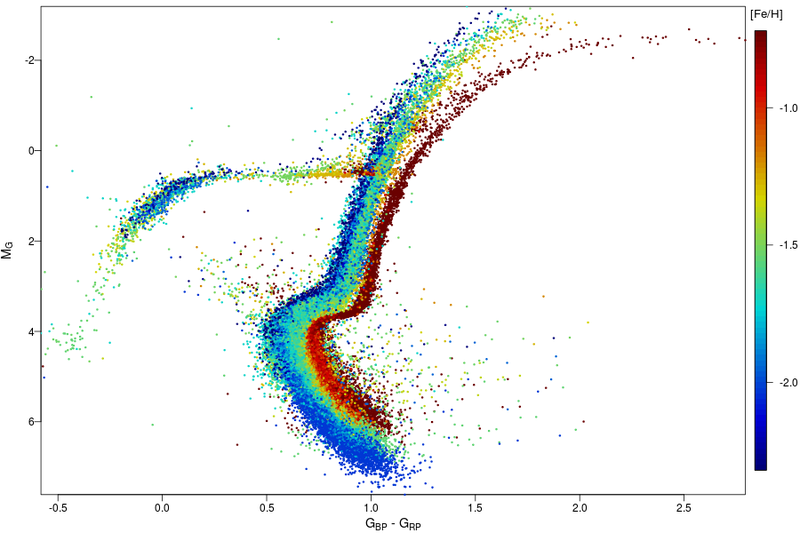 The second image (right) shows the combined HRD for 14 globular clusters. Here the differences are primarily in chemical composition, and the way this affects stellar evolution. Red contains more heavy elements, blue fewer. (Large versions of images: open clusters HRD, globular clusters HRD.) These images are from one of the science demonstration papers that accompany the second Gaia data release, Gaia Collaboration, Babusiaux, C., van Leeuwen, F., Barstow, M.A. et al. 2018a, A&A (special issue for Gaia DR2). Credit: ESA/Gaia/DPAC/Babusiaux, C., van Leeuwen, F., Barstow, M.A. et al. On 25 April 2018 astronomers opened one of the last remaining windows on the Universe, publishing the first major 3-dimensional census of over one billion stars in our Milky Way. More about Gaia Data Release 2 publication. Gaia Data Release 3 will be split into two releases: the early release, EDR3, scheduled for the third quarter of 2020, followed by the full release in the second half of 2021. Read more about Gaia DR3. Just how do you go about creating a 3D map of a galaxy? Watch cartoon What's the big deal about Gaia? What's the pay-off for me? Watch cartoon How do we benefit from space? Watch cartoon Can I be part of Gaia? Receive Gaia alerts on your phone or tablet. Download Gaia Alerts app for your iOS device. Download Gaia Alerts app for Android devices from Google Play. Test your Gaia knowledge with a quiz.